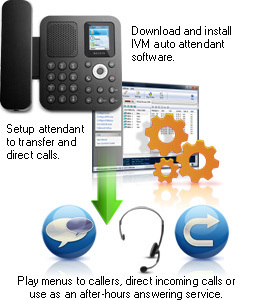 IVM can also be used for a wide range of solutions from a simple computer answering machine to running a sophisticated telephone interactive response system. Just run the install file and IVM will be ready to answer calls. Then, when you're ready, you can explore the advanced key response and programming options. This software is an effective phone management solution for small to medium businesses, giving you the power to set up any combination of these features to meet the unique requirements of any business. To help get you started, a number of example IVR files are included with IVM. After you have read the IVM manual and learned more about modifing IVR programs, these samples will give you an example of the basic setup for each particular task that you can expand upon. Professional telephony card with correct drivers More information on telephony cards. VoIP (SIP) service for voice over IP lines. Recommended SIP providers. IVM can connect multiple telephone lines with a professional telephony board or voice modem, directly to a VoIP service, or to a PBX like Axon. If you intend to use IVM with a voice modem, please note there are many voice modems on the market with defective TAPI wave/voice drivers. If you have difficulties with your modem, please see the IVM Troubleshooting Help page for some solutions to modem driver problems. IVM supports "plugins" which can be used within your interactive voice response system. We make free plugins available for a number of applications including loading and saving from databases, automatic emailing or faxing of documents, linking to an http server, connecting to hardware and much more. For more information and to download plugins, please see www.nch.com.au/ivm/plugins.html.